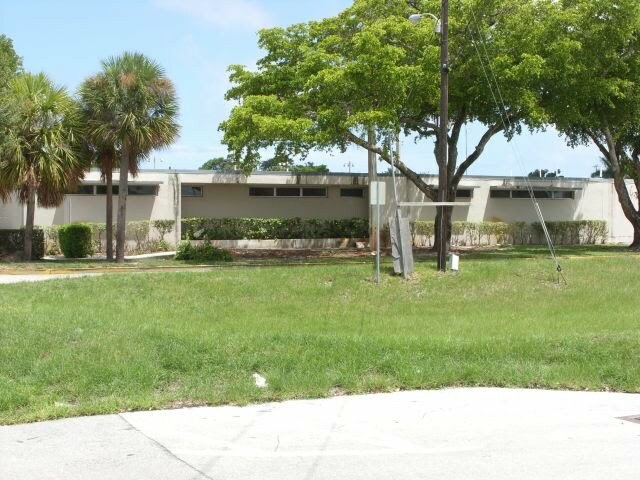 This is the last full day for the Old City Hall in Wilton Manors. Tomorrow it is scheduled for demolition. What comes in the future for this plot of land is up for discussion. The view you have here is one you haven't seen in quite a while. There used to be a trailer for the HR Department bolted down to that site. What was most surprising to me is that the line of shrubs in the planter were so lush and green. There must have been just enough light and water to keep them happy, they're even blooming. The old building is "deenergized", and without power. Water has been turned off, most likely capped off. The other services have been identified and triaged as to whether they will be removed or abandoned in place. There are hieroglyphs spray painted into the pavement all over the property and more flags showing who owns which line than there are American Flags flown on July Fourth. This was taken from the corner of NE 21st Court and Wilton Drive, a view which will change from this point onward. If you're looking forward to seeing the old thing off, today's the day to get your "Before" pictures. Tomorrow, the site will be a very busy one indeed.